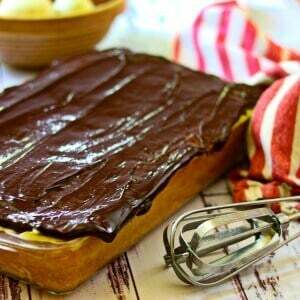 This Boston Cream Pie Poke Cake is perfect for holidays and parties. It’s an easy potluck dessert recipe that everyone loves! 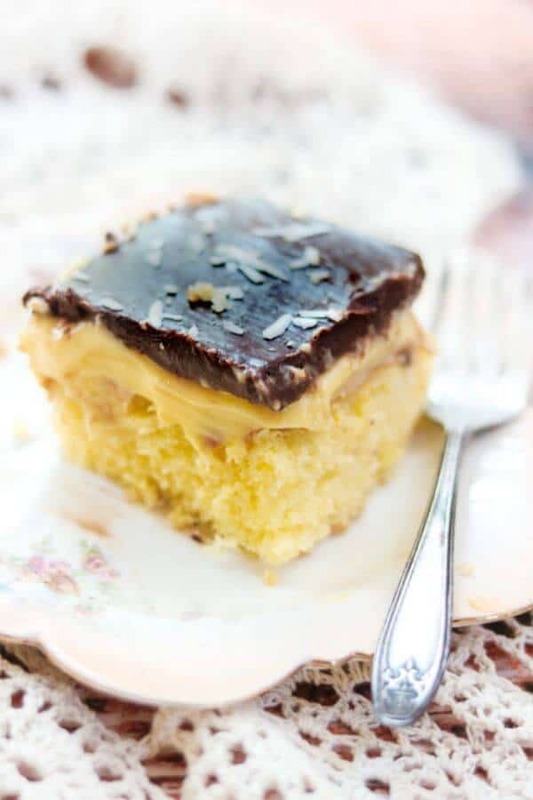 Tender, buttery yellow cake has French vanilla pudding poured over it, and is topped with a rich, shiny, ganache chocolate glaze. You can even make it a day ahead of time! Instructions for from scratch recipe as well as a recipe using a boxed mix. Welcome to day 4 of #Choctoberfest 2018! I am a pastry addict. I fell in love with cream puffs at my best friends house when I was 5 and I have fed that addiction (literally) ever since… which is 53 years if you do the math. I love the combination of creamy custard and pastry or cake, the chocolate and vanilla combo… ALL of it. So what does that have to do with Boston Cream Pie Poke Cake? 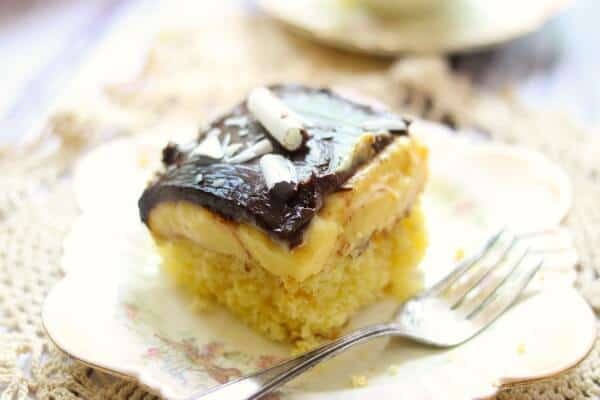 Well, as far as I am concerned a Boston Cream Pie Poke Cake is a stinkin’ easy way to get the same kind of flavor that you get in a cream puff only it takes SO much less time and is SO much easier! This is one of my favorite recipes to take to church picnics and family get-togethers because it travels so well, too. It’s a super easy potluck dessert recipe but it’s also great for family game night, or just a great way to tell the people you love that they are special. I’ve made it with boxed cake mix and boxed pudding AND I’ve made it from scratch – it just depends on how much time I have. I think I like the from scratch version a touch better but hey — whatever works for you! This moist yellow cake is filled with pools of creamy custard! A poke cake is exactly what it sounds like! It’s a cake that you poke holes in after baking. Then you fill the holes with some kind of filling. It’s so easy and SO good. Since you leave it right in the baking pan for serving it’s an absolutely perfect potluck dessert! How do you make a Boston cream filling for a cake? 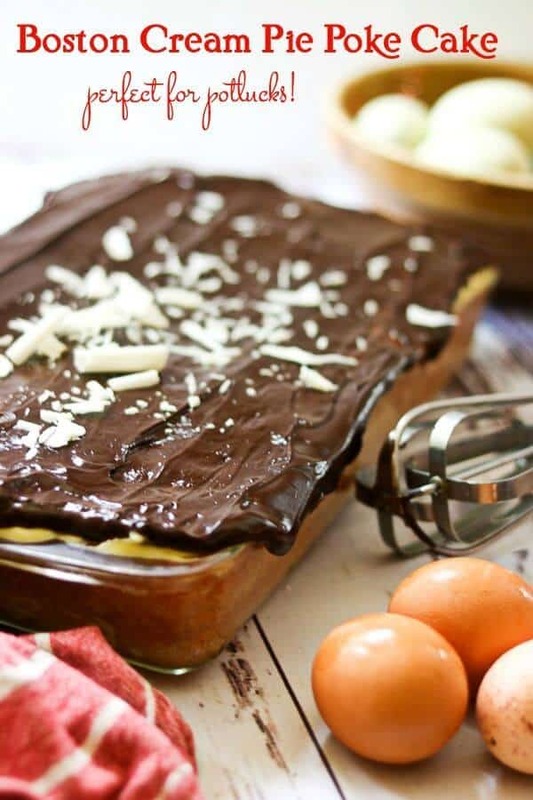 Traditionally the filling in a Boston Cream Pie is a cooked custard but you can use instant pudding mix if you want to save time. If you use instant pudding mix I suggest using 1/2 cup less milk than called for on the box. This keeps it thicker and I think it works better. Vanilla or French vanilla are traditional flavors but chocolate, butterscotch, pistachio… heck — it’s all good. Step One: Poke holes evenly down through the cake to the bottom. Step Two: Pour the pudding down into the holes, pressing down gently to fill the holes up. How do you make poke cakes? How do you make a pudding poke cake? Poke cakes are super easy. You’ll bake a cake (boxed or from scratch) in a 13×9 inch rectangular pan. Use a thin dowel or the round end of a wooden spoon handle (anything about the diameter of a pencil) and poke holes evenly through the cake while it’s still warm. Pour the liquid ingredients over – sometimes recipes call for sweetened condensed milk, or caramel sauce, or whatever. This is where you’ll pour the warm pudding over, being careful to get it in the holes you poked in the cake. Same thing if it’s a jello poke cake. Now you cover the whole thing and refrigerate it overnight to let the pudding set. Next day make your glaze and pour it over the cooled pudding. Chill it and let it set for 30 minutes and it’s ready to go! Always keep leftovers tightly covered in the refrigerator. We love our cakes around here! If you are looking for easy cakes that travel well here are some of my favorites! They are perfect potluck desserts! 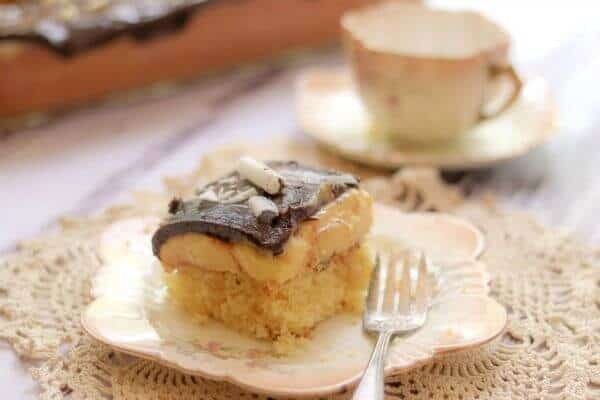 This poke cake makes a delicious addition to a quiet afternoon tea. If you like poke cakes you’re gonna LOVE this Poke Cake cookbook! It’s full of them and they are definitely unique. You’ll be the queen of the church potluck in no time! 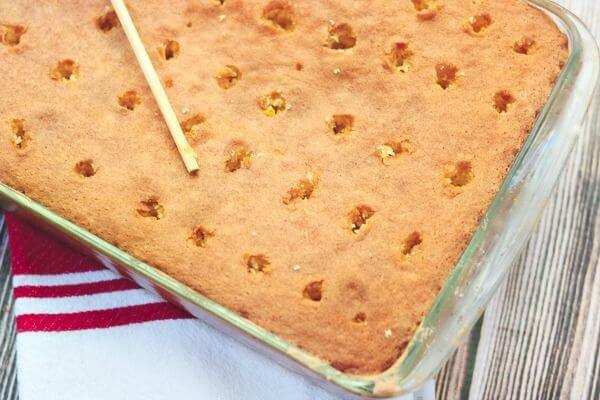 This easy poke cake recipe is sure to be a family favorite! Don’t forget you can vary the filling flavors to create a variety of cakes from this recipe. 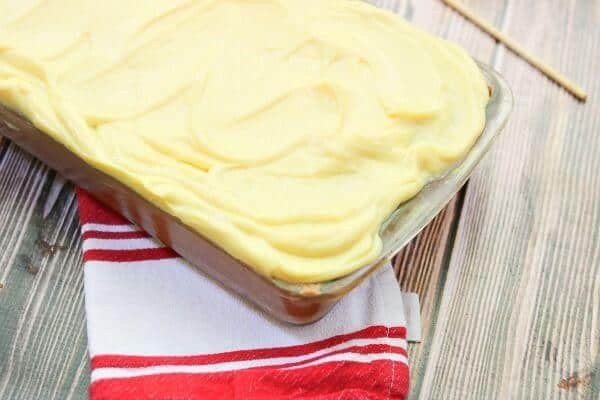 🙂 You can ever use half vanilla pudding and half chocolate pudding so that each side has its own flavor! How cool is that? Pretty dang cool. If you love this recipe please give it 5 stars. Thanks! Easy potluck dessert recipe! This Boston Cream Pie Poke cake is made with a moist yellow cake, vanilla pudding, and a shiny chocolate glaze! 1 batch of homemade vanilla pudding made with 1/2 cup less milk than called for in the recipe. Make the cake according to directions, baking it in a 13x9-inch pan. While the cake is still warm poke holes all over the cake at about 1 inch intervals using a dowel about the same diameter as a pencil - maybe a little bigger. Poke through the cake to the bottom! Whisk together the instant pudding with 3 1/2 cups of whole milk. OR make the homemade pudding according to instructions. Do not let it set up. Pour evenly over the cake getting it into all the holes. A lipped measuring cup works great for this. Spread the pudding over the cake pushing it gently into the holes. Let the remaining pudding for a thick layer on the top of the cake. Heat the cream and butter in the microwave until almost bubbling. Remove from the microwave and stir in the chocolate until it's melted and completely smooth. Pour over chilled cake and smooth with a spatula. Return to the refrigerator for 30 minutes or more. The calorie calculations are only an estimate because there are so many variations possible in this recipe. I made this recipe last week. It is a real keeper. In case your readers wonder, leftovers freeze very well. There are only 2 of us, so we had a lot left. I cut it up into individual servings and froze them. Just take out what you want and let it thaw in the fridge overnight. It didn’t take us long to polish off the rest. This was easy and delicious. Thank you for sharing it with us. This cake sounds wonderful! *pinned!